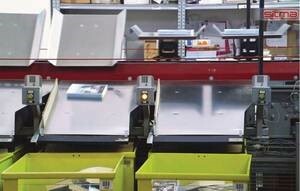 Sitma offers various sorter models, such as modular tilt-tray sorters which are very flexible (processing from small books to large parcels) and are easy to install; pocket sorters for single books and medium-sized parcel, which are very popular particularly in Italy where Sitma has developed the first systems for the distribution network of the publisher Mondadori. By expanding its product range Sitma continues the way of innovations which always characterized the company and enhances its activities in the sectors mailroom and intralogistics. SpeedySort pocket sorter is designed for distribution and the rerun of books and flat items, with horizontal closed loop design. The fed product runs in a circular route and is released into the assigned output trolley. In case the output is not available (because it is full or removed by the operator) the product remains inside the pocket as long as the related exit is not free/available.